Previously, we looked at how stocks act when the ECRI leading index is down 6% or more for the first time in 12 months. That analysis makes sense in this specific situation because the index recently fell over 6% year over year. ECRI also has a chart where they show recent corrections have all occurred when it determined the U.S. economy was in a slowdown. Knowing that stocks tend to correct during slowdowns discounts the notion that corrections are completely random as many pundits claim. The pundits just don’t see the slowdowns, so they don’t know what’s happening. In this latest downturn, the stock market reacted much quicker than the high yield market. However, Treasury yields fell. During the stock market recovery, high yield bonds rallied, while Treasuries haven’t reacted. The chart below is the most complete picture of how stocks and the ECRI leading index are correlated. It shows both series going back to 1968. 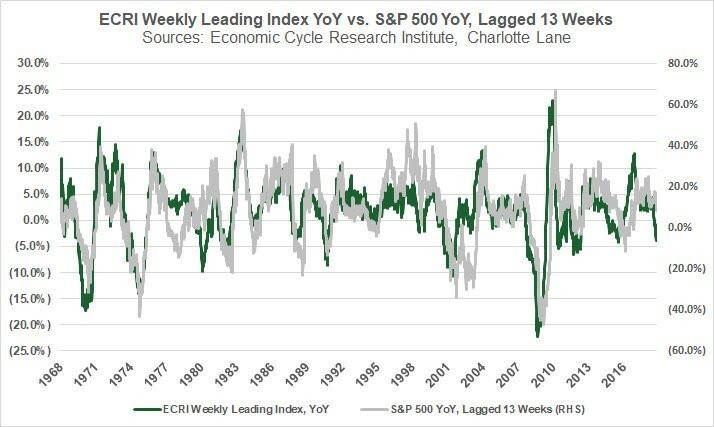 They are highly correlated when the ECRI leading index is pushed forward 13 weeks. To be clear, the stock market correction already occurred. Interestingly, stocks bottomed before the ECRI leading index did. Furthermore, stocks have recovered quicker. This situation is similar to the treasury curve. Usually, the economy falls into a recession over one year after the curve inverts, and the stock market falls before the recession. In this case, stocks fell before the inversion. The 10-year 2-year yield curve still hasn’t inverted. Interestingly, even though the Empire Fed manufacturing reading was very strong and other soft economic reports have been weak, the Philly Fed manufacturing report was strong. As you can see from the chart below, the Philly Fed general conditions index increased from 9.1 to 17. That beat estimates for 10 and the high end of the range which was 14. Monthly industrial production growth hasn’t always correlated with the Philly Fed index. I use the regional Fed manufacturing reports to project the ISM manufacturing PMI.